ECOLINES has been operating in the international market for coach and bus services for 20 years. By working hard and continuously developing, the company now offers the most extensive route network in the Baltic States as well as in Western and Eastern Europe. Since its inception, ECOLINES has become one of the largest and most successful companies in Latvia! The success of ECOLINES is based on the sense of responsibility for our passengers. The company prides itself on its accuracy and transports passengers and their luggage in accordance with international standards. ECOLINES lays special emphasis on the professionalism of its employees. The company selects only seasoned and well trusted bus drivers to ensure passenger comfort and safety on all routes. 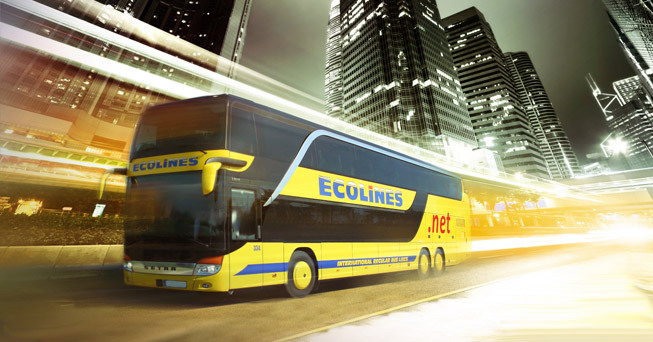 ECOLINES maintains its coaches in accordance with European standards and continually expands the range of routes. ECOLINES was the first coach operator in the Baltic States to implement a multimodal transportation system that facilitates travel and luggage transportation from one destination to another. In addition, a special bonus program was created to encourage passengers who choose our services frequently. ECOLINES is characterized by the constant care of our passengers and their comfort. The company boasts a specially developed quality management system, which allows us to fulfil customer requests during both domestic and international trips. Quality Internet is available for free on most ECOLINES routes. During the long trips, specially trained stewards will take care of passenger comfort.Pricing policy of the company allows to offer our customers discount tickets on a regular basis. You can monitor discount information online on the ECOLINES website and in the following social networks – Twitter, Facebook, VKontakte, Google+. We at ECOLINES are aware that the company has managed to take its leading position thanks to making rapid adjustments to meet the needs of our passengers. The goal of ECOLINES is to offer a full range of travel services! According to the wishes of our passengers, the company is ready to help not only with coach transportation, but with visas, travel insurance, tour organization, bus rental.By listening to customer requests, ECOLINES reaches new heights!